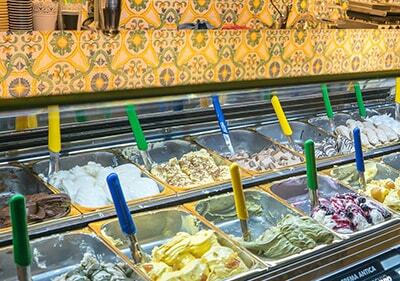 Enjoy the moment with delicious Italian gelato from Ice cream parlour in Liguria. Finest quality, fresh ingredients, broad variety of flavours ice cream will amaze you! Try stracciatella, pistachio, crema, cioccolato, frutti di bosco, melone ice cream flavours and many more! 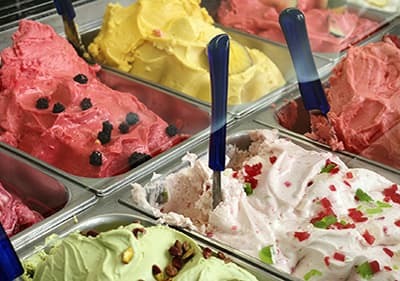 Ice cream does not only taste in Portofino at the harbor in northern Italy, but delicious Italian ice cream can also be found in many small ice cream parlors in the Ligurian hinterland as a homemade production. A "Gelaterie Artigianale" prepares fresh ice cream without preservatives. Main ingredients of the cream ice cream are milk and sugar. Airy ice is mostly produced by industry, since it is stored at minus 25 degrees and thawed before serving and pitched again. Basic features of good cream ice cream: It should not burn the palate and should not also be kept at too low temperatures, it should melt on the tongue with a firm consistency and on the ice in the bar no water or melting layer should be seen that would be a sign of too high temperatures. Pay attention to clean ice buckets during the purchase. Ice cream held "in the hand" is a Gelato da passeggio. There are no ice balls in the Italian Ice cream parlors, but the amount of ice is calculated according to its flavors; that is "Gusti". Un gusto is therefore just like a ball, on which you can then add due, tre, quattro gusti. Payment is done in advance at the cash register; you then get your ice with the receipt at the counter. It must be mentioned here that you will be asked whether you prefer "Coppa" (cup) or Cono (waffle). This is how you order for a family ice pack, you would like to take to your apartment or holiday home: Vorrei una confezione / una vaschetta da portare via (I would like a cup of ice cream as take away). The ice cream vendor will then suggest appropriate sizes to you, whereby mezzo-un chilo weighs half a kilo. Nocciola pronounced as Notschola (nut ice cream), and many other popular varieties. Of course, traditional sorbets with fruit ices are available or an ice cream sundae "Granita", which is acceptable refreshment on hot days with crashed ice with an addition of juice. A -Gelato variegato- is an ice varied with fruit and juice, often with marbled ice according to your taste variety. An Affogato is a drowned type of ice cream, just like with us the Ice Cream Café where several Ice cream taste orientations in coffee, whisky or chocolate to be drowned, so to say. Try out a -Mangia e bevi- (Eat and drink) consisting of liquid ice cream and fruit, the ice is drunk and the fruit eaten, what a pleasure!